Wallfahrtskirche was restored in 1885 and it was probably at this time that some of the choir windows illustrating the Life of the Virgin Mary were removed. This panel depicts St. Anne at the moment when an angel comes to tell her that she will conceive a child. The angel had already visited her husband, Joachim, to say that Anne would conceive and give birth to a girl who would be called Mary. This story is an obvious parallel to that of the canonical story of the Annunciation to Mary. The angel informs Mary that she is with child and will give birth to Jesus, saviour of mankind. The elderly St Anne sits on a bench, the base of which is perforated with narrow rounded arches. The bench is under a high canopy, connected to it by two columns rising from its back. 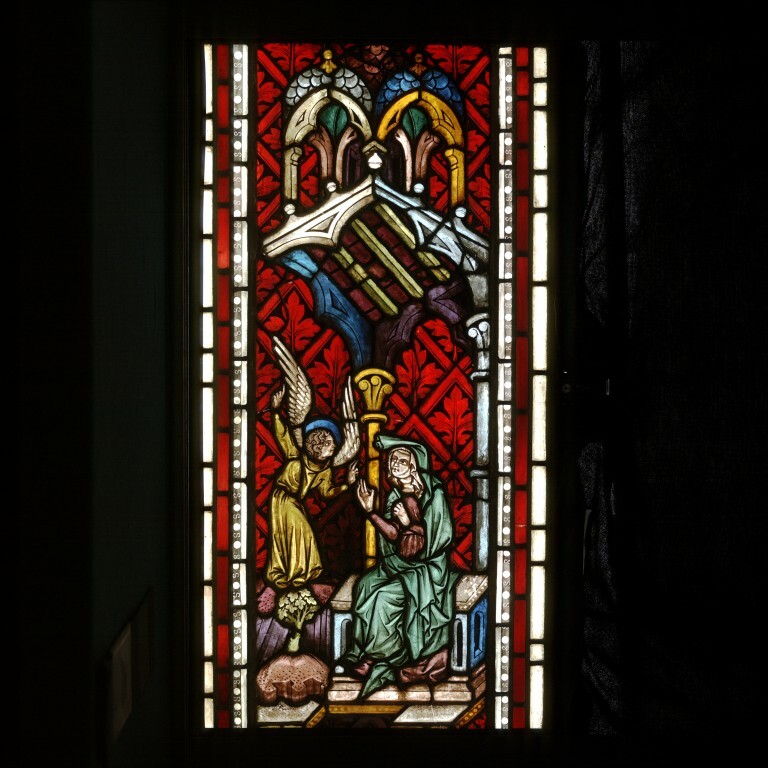 The angel stands on the left of the panel, blessing St Anne and with his right hand pointing to heaven. The background is composed of a diaper of stylised oak leaves within diamond-shaped vesicles. These two panels were originally from the north window of the choir of Wallfahrtskirche in Strassengel, near Graz in Austria. Graz is the capital city of the Austrian state of Styria. The panels formed part of a series of windows depicting episodes from the Life of the Virgin Mary. The church was consecrated in 1353 and it is believed that this series of windows dates from that time. Panel of clear, coloured and flashed glass painted with brown/black pigment. 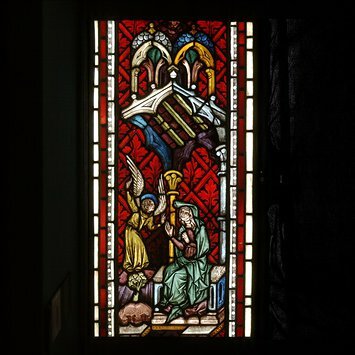 Depicting the Annunciation to St Anne. Originally from the Wallfahrtskirche (Marian pilgrimage church) in Strassengel. Made in Austria (Styria), about 1350-1355. Foister, Susan, Art of Light: German Renaissance Stained Glass(London: National Gallery Company, 2007), 32 p., ill., ISBN 978 185709 348 3. pp. 8-9. ill.